I'm not sure why but Blogger is not cooperating with the link to my Etsy shop. For anyone interested, here is the correct link: www.lesliestamps.etsy.com. Have a great weekend! I love Christmas! The colors, smells and comforts that surround it. So, imagine the fun I had last weekend with Cindy and Sue as we spent it in the country working on our Christmas cards. It has been an annual tradition to get together and work on our cards but this year we spent it at Sue's country home. Awesome place, food and scenery. My mojo was cooperating, which is always nice. So, this is the first of my Christmas card creations. Its Fall, my favorite time of the year. I love the crisp air, cooking with apples and cranberries, wearing sweaters, football games and fireplaces. 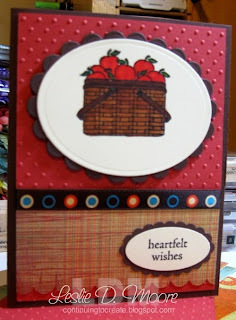 That’s why I decided to use PTI’s stamp set, Vintage Picnic, to make a Fall birthday card. The patterned papers were taken from my Basic Grey stash and the cardstock is from SU! I decided to use my Copic Markers to color the apples and stamped the image with Memento ink. The background was embossed with the Cuttlebug Swiss Dots folder, which I love! The mats were cut with the Spellbinder’s Oval dies. I did add “bling” on the image with the Copic Spica pens, but it is not showing in the picture. Luckily, the ribbon was found in my stash. 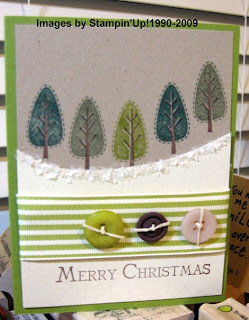 Be sure to visit PaperTrey Ink’s website, as Nichole released darling holiday items today. It’s difficult to make sympathy cards when you need them. This past week, two of my dear friend's lost parents and it has really saddened me. 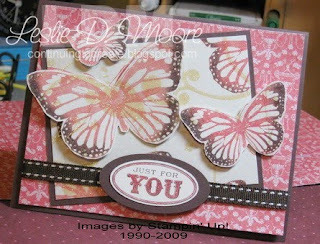 I’m also grieving over my decision to leave Stampin’ Up!, after being a demonstrator for 9 years. So, this weekend, I had one of my “play dates” with Cindy and Sue. Each planned card ended to be a disaster. Finally, I threw everything in my bag and headed home. Determined to not settle for defeat, I created Sympathy Cards that evening. This card was made using the Medallion stamp, by SU! I love this stamp and can see it being used multiple times for various occasions. I chose my colors, Sage Shadow and Chocolate Chip, from the SU! patterned paper. I decided to spotlight part of the Medallion image by matting and adhering it over the remainder of the image. The small sentiment fit perfectly over the card. The ribbon was found in my stash and adhered after a faint amount of Stickles was applied to the card front. I like keeping my Sympathy cards simple, but this one needed a little spark and the fine glitter was perfect. The month of September is very special to me as I celebrate Labor Day and remember the terrorist bombings. I recall our soldiers and the terrific sacrifices they make to serve and protect our company. That’s why this month I’m volunteering hours to make cards for our soldiers. Ironically, Cards for Heroes. org is also celebrating this month with a new name and website, Operation Write Home. You’ll notice above the stack of cards I’ve been working on to mail. This is a great cause and will only take a little time. I strongly urge you to check out the website and consider sending them a donation of handmade cards, stamps, envelopes or money. And, if you are making cards, be sure to follow the listed requirements. Some of the “bling” we like to use on our creations can actually harm the soldiers, so please read before sending your cards. Now get busy and participate with us today! This was a simply made card due to DCWV gorgeous, glittery patterned papers. I simply trimmed the printed butterflies out of the patterned paper and adhered them to a coordinating background. Using the SU! 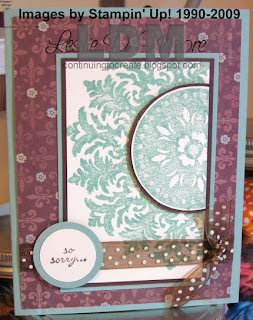 stamp set, Only Ovals, I stamped the sentiment with Basic Brown ink and colored with the Regal Rose marker. Using the coordinated ribbon from SU!, I matted everything onto a Chocolate Chip card front. I love finding patterned papers that coordinate with my supply of inks. It's another birthday card for a busy time of year. Here's an opportunity to win free fabric from the Vintage Workshop. All you need to do is leave a comment on their blog. The fabric is gorgeous and would make a beautiful quilt. Take a look here.